There are a lot of tools within LinkedIn Recruiter, with many of them grouped under the “Recruiting Tools” bar that appears on right hand corner of every profile page (pictured below). In previous posts, we’ve already covered how to use “Update Me” (the star icon in the toolbar), “Custom Fields” (the icon composed of three horizontal lines) and “Projects” (the folder icon) that appear in this toolbar. In this post, we'll focus on the three icons located in the middle of the toolbar: notes, attachments and reminders. What is it? – Notes allow you to capture brief notes about each prospect during or after a screening call or at any time during the recruiting process. Any note that is captured can be view by your colleagues, ensuring that your team is on the same page about the prospect. What's the point? – Best practice dictates every time you talk with an ideal candidate, you capture and post a note briefly describing the interaction. 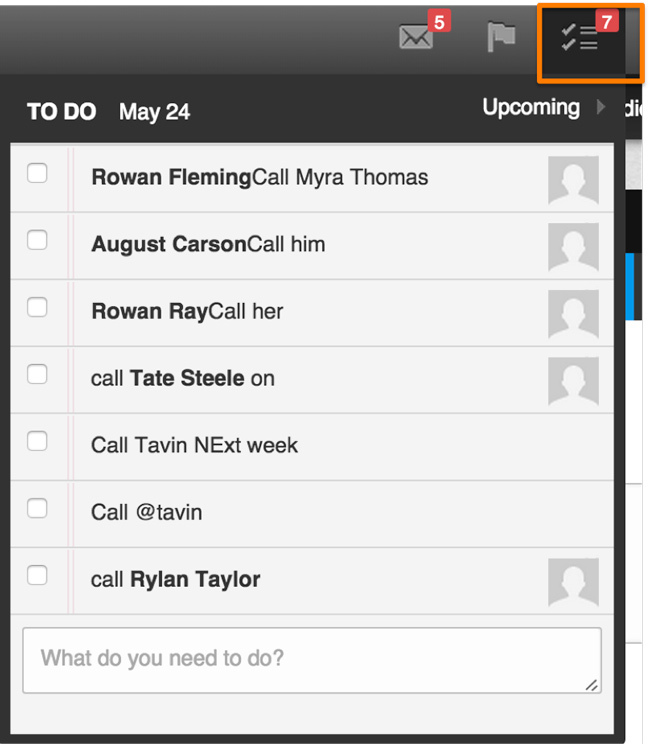 This way, everyone on the team has a complete account of the prospect’s interaction history with your organization. How does it work? – On the “Recruiter Tools” toolbar, notes is the icon that looks like a piece of paper with a fold in the bottom-right corner. 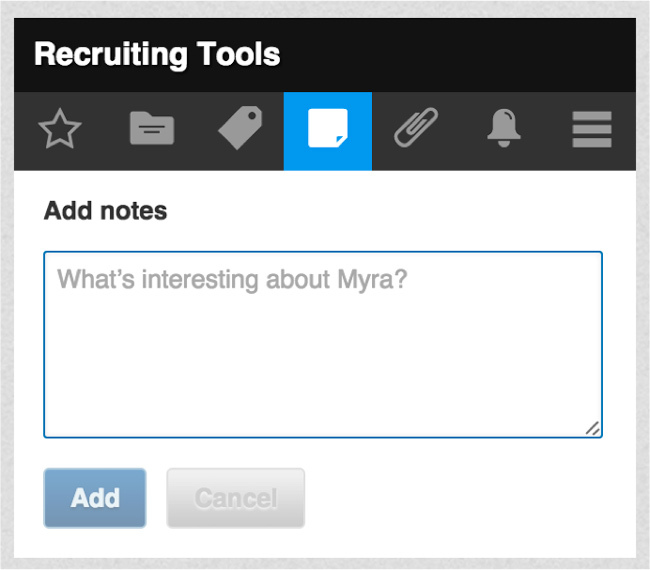 If you click on it, you can add your note (pictured), which will be appear in the “recruiting activity” bar in a prospect’s profile. And as an added value, all of your notes are searchable items. So any unique aspect you capture in the notes section during your conversation with the prospect is searchable from anywhere on Recruiter. What is it? – Attachments, as the name suggests, allows you to quickly attach a candidate’s resume, files, and any related websites to their profile, which can be seen by your entire team. What's the point? – With the ability to attach links, files and resumes to a prospect’s profile, you can build a richer profile on each prospect. For examply, links are helpful for hiring someone in a creative position who has an online portfolio. How does it work? 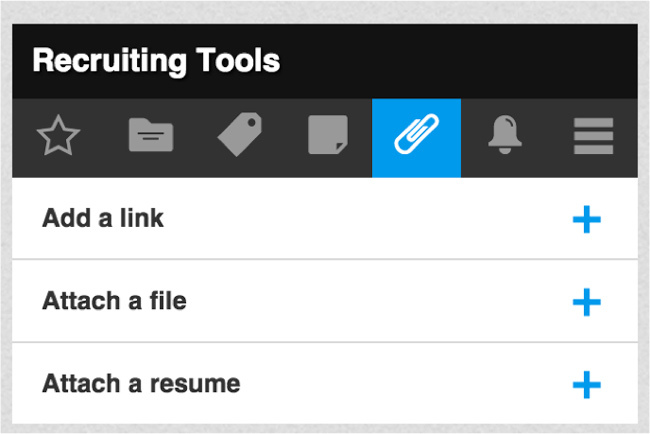 – On the “Recruiting Tools” toolbar, “attachments” is the button that looks like a paperclip. 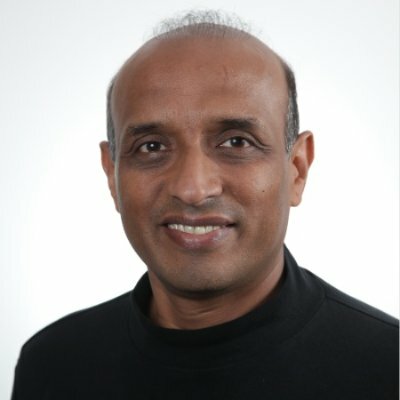 Click it and then upload a file, resume or link. And as with the notes feature, any attachment you add to the profile is only viewable to you and your teammates. What is it? – If you put in a reminder in our system – say, to call a candidate in two months – it will notify you on the selected day – two months later – to take the required action and call the candidate. Like attachments and notes, reminder settings are also visible to other members of your team. What's the point? – Obviously, reminders ensure you don’t forget to do certain tasks and help you organize your day. Additionally, they ensure another recruiter doesn’t contact a prospect you were planning to contact, as they’ll see the reminder on LinkedIn Recruiter. How does it work? 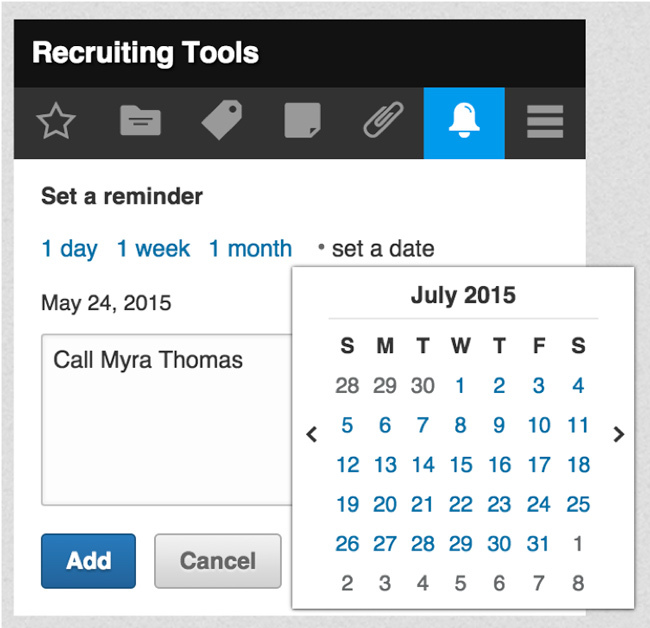 – On the “recruiting tools” toolbar, reminders is the icon that looks like a bell. Simply click it and then add the task and the date you’d like to be reminded of. Once you have set the reminders, they will be displayed on the navigation bar on your LinkedIn Recruiter at all times (see below). 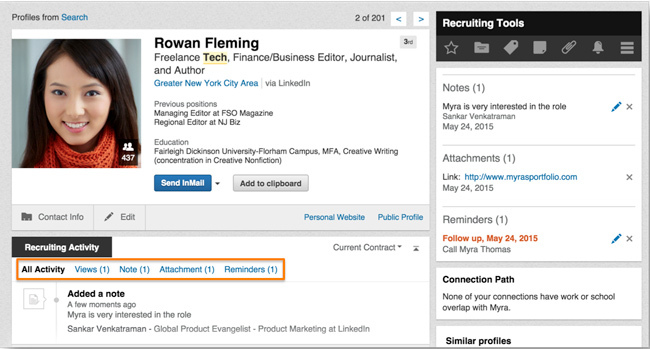 Upon mouse-over, you can see all TO DO activities including the ability to “@” mention anyone on the LinkedIn network. The notes you add, the attachments you affix and the reminders you set on a profile are visible to all members of your team from just below the profile top card image (see highlighted box below). This ensures that you and your team are all on the same page with respect to the status on the recruiting activity of any prospect of interest, improving collaboration, efficiency and delivering a better candidate experience.